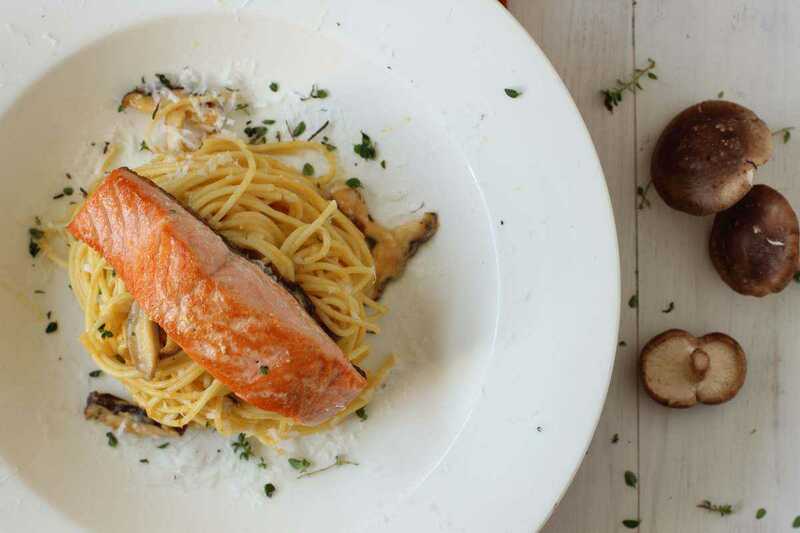 Pumpkin Pasta with Shitake Mushrooms and Seared Coho Salmon. Did you know October is National Pasta Month? This means you have to eat some form of pasta everyday until Halloween! I’m just kidding but I really wouldn’t mind if someone challenged me to eat that much pasta. Cooking pasta is simple, affordable and can easily fit into busy lifestyles. I used the word simple didn’t I? But I wasn’t kidding, the choices of pasta are endless. Take a look at how many dried pasta varieties there are in the store next time you visit. It’s perfect for a fast weeknight dinner and a little goes a long way. I know as I add it to the boiling water I’m always thinking that it isn’t enough, so I add another handful. You know what…it’s always too much and the leftovers are packed up for lunch the next day. You can add a sauce to it or keep it plain with some olive oil and herbs. Don’t feel bad if you buy a jar of sauce, there’s loads of really great sauces available and I always like to add about a half cup of red wine and a bunch of fresh herbs to kick it up a notch. Since we’re into fall now, I thought I’d make this pumpkin pasta with shitake mushrooms and pumpkin sauce. 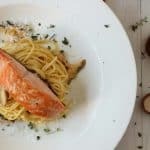 This recipe is so adaptable, I added some great coho salmon but it’d be great with chicken or extra vegetables. The sauce is quite creamy but a little goes a long way, so be wary when you add it to the pasta. You can always add more but you can’t take it away. Personally I like it on the lighter side but the sauce is just so tasty! You can also use any fresh herb such as thyme, rosemary or oregano and don’t forget that cheese. Right before serving, grate some fresh Parmesan or Pecorino Romano on top. I mentioned about always having leftovers but there wasn’t a trace of this dish left! 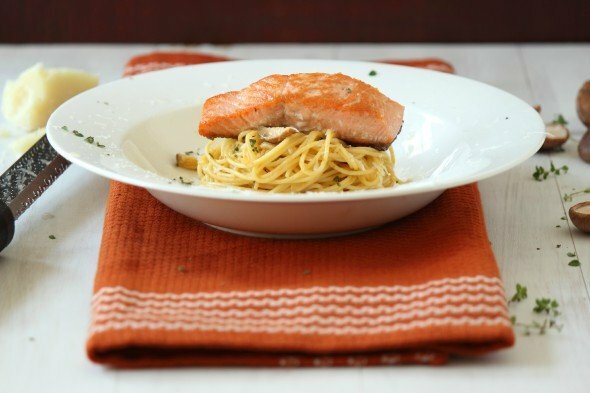 To get you in the mood and to celebrate pasta month, the National Pasta Association is hosting the Pasta Presto Recipe Contest! Just click here to enter your own spectacular recipe and you could be the winner of a $1500 cash prize. So if you have a recipe which has been in the family forever and everyone loves it, make sure to enter. You might just win! This is such an easy meal to make and loaded with yumminess! Heat the oil in a heavy non-stick skillet. Add the sliced mushrooms and cook until browned, about 2-3 minutes. Take the mushrooms out of the pan and set aside in another bowl. Add the shallots cooking until they become soft and translucent. Add the wine and 3/4 cup of the broth. Cook until it reduces by half. Add the cream and reduce again until the sauce becomes thicker and coats the back of a spoon. Add the pumpkin and whisk until the sauce is smooth. If it's too thick you can keep thinning it down by adding more broth. Season with salt and black pepper. Bring a pot of water to a rolling boil and cook the pasta as per the instructions on the pack. Heat the other tablespoon of oil in a pan over a high heat until it starts to smoke. Place each piece of salmon into the pan, skin side up. Sear the salmon for about 3 minutes before turning over. Lower the heat and cook the salmon for about another 5 minutes. Drain the pasta and return it to the pot it cooked in. Start to add the pumpkin sauce to it gently tossing with a pair of tongs. Add as much sauce as you prefer then add the cooked mushrooms making sure all the pasta has been coated. Place some pasta on a serving plate or bowl and top with a piece of the salmon. Garnish with fresh thyme and grated Parmesan or Pecorino cheese. « Huge Cook Book #Giveaway! I can eat pasta every day until Halloween? Perfect, I’ll be a doughboy and wont need to buy a costume! In all seriousness, this looks delicious! Mmm this sounds positively delicious and looks beautiful mounded high in the bowl. Such a creative way to use pumpkin and pasta. I love it! Beautiful Gerry. 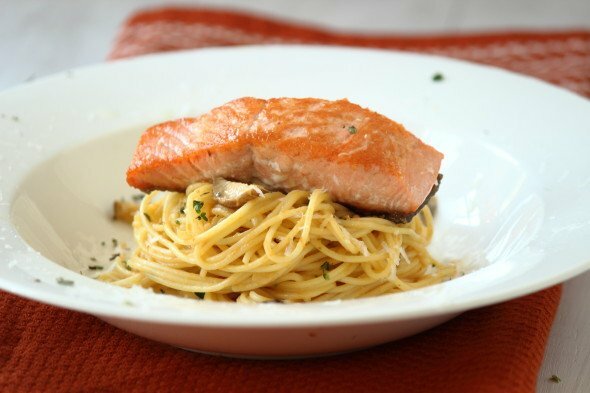 The salmon looks perfectly cooked and the pasta just creamy enough. Lovely recipe. 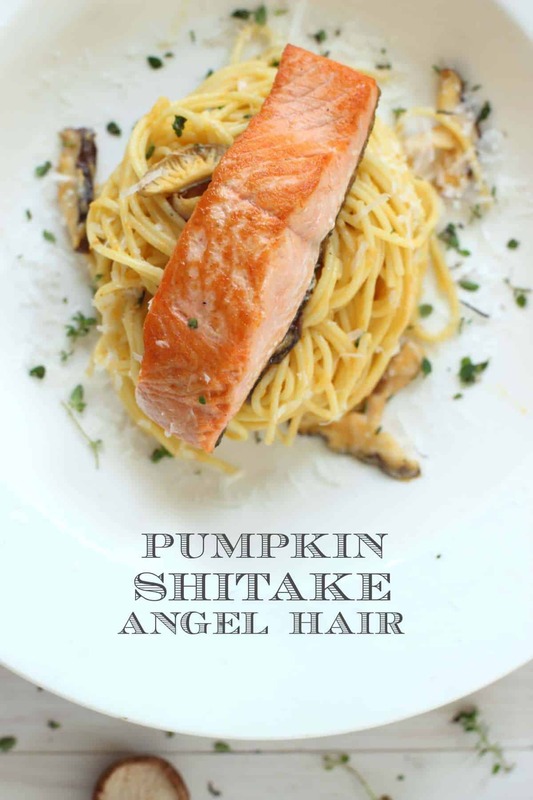 This looks so delicious with pumpkin and salmon! I would have NO problem eating this everyday for the month!!! Oh I know you wouldn’t! Trade you for some pumpkin squares..
Love pumpkin. And the sauce sounds nice and light! I always, ALWAYS add too much pasta to the water when I’m cooking it. Why is it so freaking deceptive? Love how simple and easily adaptable this recipe is! And I’ll go for shiitake mushrooms every single time. My favorite. Oh man! I am loving this. I always serve the same thing with salmon, veggies and rice. It gets kind of boring. I love the thought of serving it with this pasta! yum! Nice an excuse to eat pasta everyday this month! I love this recipe. Mushrooms and pumpkin! I’m sold. Your pumpkin sauce sounds mouthwatering, this is a restaurant-worthy dish! I love pasta month, and I love this post featuring some of my favorite foods. Thank you for putting this one together!! This sounds SO delicious. I love salmon! And pumpkin! A match made in heaven! Looks good:) Pinned your pumkin bars.. I have chantrelle mushrooms burning a hole in my pocket, AND I have just about everything to make this sans cream and wine. May go for a beery version and hope almond milk + jalepeno feta can double as a creamy component…. Thank you for share.It very nice.I like to eat Salmon.